Roger Goldenberg is a New Hampshire native, born and raised in its North Country. He attended the University of New Hampshire where he earned a BS in Geology (1981) and participated in two research expeditions to Antarctica. 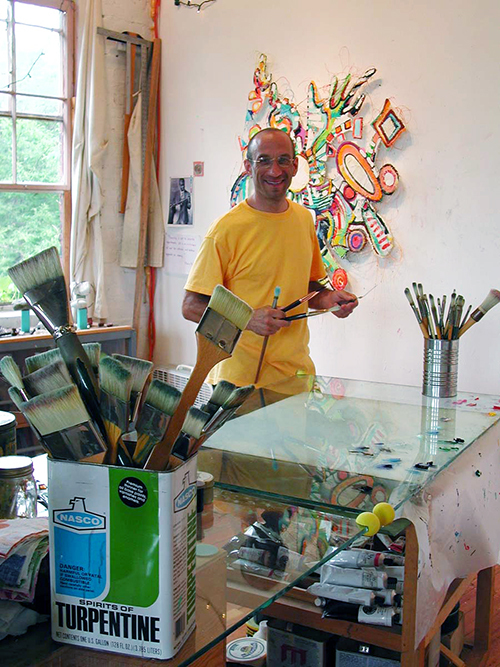 Roger returned to UNH to earn his BFA (1991) and later his MFA (1995) at the University of North Carolina–Greensboro. Immediately following graduate school, Goldenberg moved to Portsmouth, NH, where he located his studio at the Button Factory. Attracted to the secluded space by its high ceilings and seven huge windows, he worked there for twenty years. Goldenberg’s path to visual arts was circuitous, having worked briefly in Geology followed by a lengthy career as a carpenter. As a woodworker he became expert in cabinetry and historic restoration. In 1989 Goldenberg restored the facade of the Wentworth-Gardner House, a National Historic Landmark in Portsmouth, NH. From 1995–1999 Roger served as adjunct painting and drawing instructor at UNH. Subsequently, he taught a life drawing class for the New Hampshire Institute of Art at Sanctuary Arts, Eliot, ME and a series of woodcut and monotype printmaking workshops at the AVA Gallery and Arts Center in Lebanon, NH and at his studio in Portsmouth, NH. Currently Roger teaches drawing and watercolor at Granite State College and the Portsmouth Music and Art Center. Roger is on the faculty at the AVA Gallery and Art Center in Lebanon, NH, at Great Bay Community College and Norwich University where he is scheduled to teach mobile making, drawing, sculpture and painting. In 2002, Goldenberg answered the call for board members on the Portsmouth Cultural Commission. His tenure began a year later in 2003 as the vice-chair of the newly formed city commission named Art-Speak. He also chaired its Arts Space Committee. While on Art-Speak, Goldenberg spearheaded the formation of the Portsmouth Emerging Artist Coalition (PEAC) filling the role as its advisor. Following this two–year board position Roger joined the board of directors of Portsmouth Music and Art Center (PMAC). While on this board he chaired various committees including the Nominating Committee. From 2003–2008 Roger Goldenberg collaborated with New Hampshire Philanthropist, Tom Haas who began purchasing Goldenberg’s visual jazz paintings to donate to children’s museums throughout the United States. It began at the Portsmouth Children’s Museum where Haas began fulfilling his wish to give many children and parents throughout the U.S. the opportunity experience Roger’s paintings. At the completion of this collaboration 26 paintings were owned by 25 children’s museums across our nation including the Montshire Museum near Goldenberg’s new studio in Lebanon, NH. In 2014 Roger applied and was accepted onto the the New Hampshire State Council on the Arts Artist in Education Roster for his individual teaching and for his collaborative project In Ears ‘n’ Eyes Creativity Workshop. Also inducted were two jazz musicians and In Ears ‘n’ Eyes personnel, vocalist Taylor O’Donnell and trumpeter Chris Klaxton. 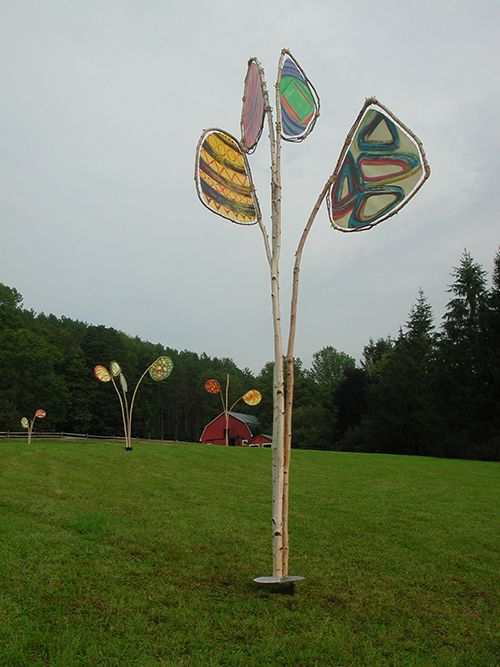 Roger was the featured artist at the 2011 Sculpture Fest in Woodstock, VT. His site-specific kinetic sculpture “All the Colors: A Visual Jazz Suite” delighted viewers by transforming a five-acre hillside landscape with his ever-changing visual music. 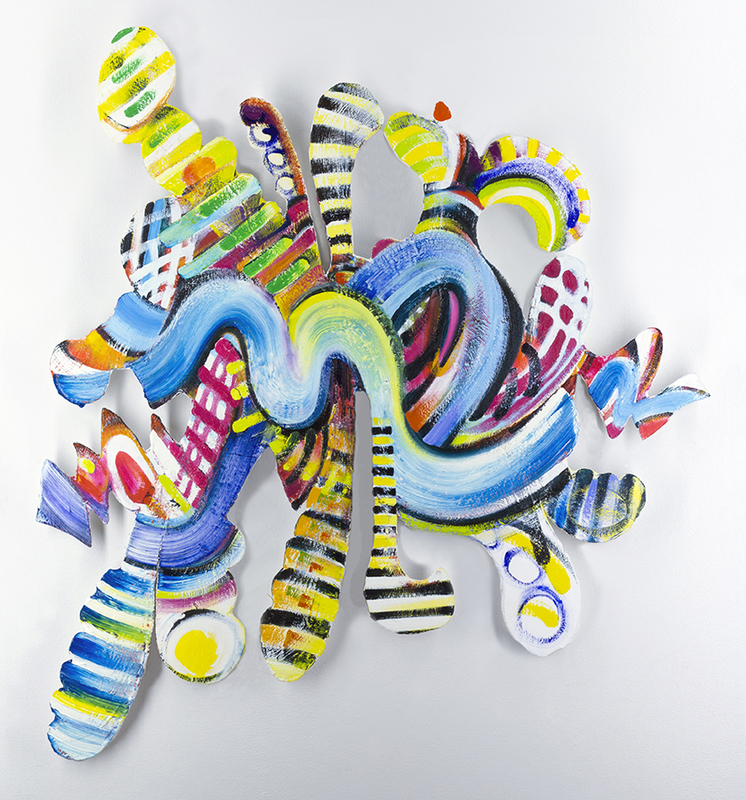 Goldenberg’s artwork is in private collections both nationally and abroad, and in public collections at the University of New Hampshire and the Weatherspoon Art Museum in Greensboro, NC. Twenty-six children’s museums throughout the United States are proud owners of Roger’s colorful paintings, provided through a program funded by a generous donation from philanthropist Tom Haas, a former resident of Keene, New Hampshire, now residing in nearby Durham. Roger Goldenberg moved from Portsmouth in January 2016 and now maintains a painting, printmaking and sculpture studio at his new location: The AVA Gallery and Art Center on Bank Street in Lebanon, NH 03766. Please view a sampling of his work in his web gallery on this website or contact him directly to arrange a studio visit.